I've been watching a lot of grifter stories lately. I had to watch the first four episodes of TNT's "Leverage" in a very short span, re-watched a bit of "Hustle" before doing the "Leverage" review, and keep stumbling across "Ocean's Thirteen" while channel-surfing. And because I have so many elaborate fictional con schemes rattling around my skull, it made the one in "Chuck vs. the DeLorean" seem a little thin in comparison. Yes, it's a wonderful grand gesture that Sarah's dad tries to get away with selling a skyscraper he doesn't own (the 21st century LA equivalent of the Brooklyn Bridge, I suppose), but the actual plan to get the sheikh to give up the $10 million -- and to give up the account numbers that would allow the CIA to freeze his assets -- struck me as very simple, and the kind of thing that would require a really gullible terrorist financier to fall for. 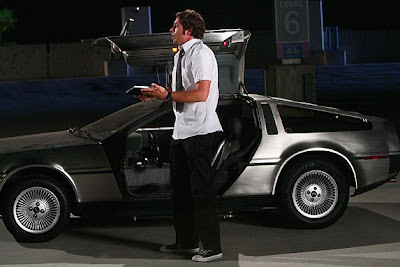 But if you're willing to file the entire scam as this week's gaping plot hole we have to ignore to enjoy the rest of the wonderfulness, then "Chuck vs. the DeLorean" was very much in form after last week's minor misstep. Gary Cole is great virtually all of the time. That's a given. (The rare exceptions are roles like the one in "Pineapple Express" where he's not given anything to do, as if his mere presence will elevate material that isn't there in the first place.) He's so comfortable in his own skin, and in the skin of whatever character he's playing, that I bought him as a master con man even when the episode itself wasn't always giving me much evidence of that. And I thought Yvonne Strahovski again knocked a showcase episode right out of the park. She played so well off of Cole, and did such a fine job of showing how badly Jack has hurt Sarah in the past, that I just went with a lot of the material that was on the skimpier side. It helped that, unlike last week, there were only two stories, and Morgan's purchase of the titular DeLorean took a decided backseat to the main action, which gave the A-story more room to breathe and more time for nice small moments like Jack dubbing Casey "Cop Face" or Jack swiping the victory cigar back almost immediately after giving it to Casey. And it was a nice tweak on the show's recent formula to have a spy world development (the sheikh stealing the DeMorgan) provide a solution to a nerd world problem (Morgan needing money to repay Captain Awesome), when it's been vice versa of late. And the DeMorgan subplot provided more than our usual complement of '80s references, from the car itself to the use of Yello's "Oh Yeah" (famous from both "The Secret of My Success" and from the scene where Ferris Bueller admires Cameron's dad's Ferrari, which provided the model for Lester's dialogue here) to the General Lee punchline. • Is this the first time we've actually seen customers in the Orange-Orange? And since it's a CIA front for The Castle instead of a regular business where Sarah works, are there other CIA agents who have to man the counter when Sarah's off on a mission? Or does the place constantly have a "Back in 5 minutes" sign on the door? • Along similar lines, what happens if the company changing the upholstery on the Nerd Herders finds all the extra bonus features in Chuck's car? • Hearing Devin propose such a high interest rate and threatening to pluck clean the very hirsute Morgan suggested an alternate nickname: Captain Shylock, anyone? • So Chuck says his wayward dad was an engineer. Does that make it more or less likely that Papa Bartowski was really a spy? • I am now convinced that there's some kind of contest in the "Chuck" writers room to see who can slip in the most obscure athlete name into their script. This week's contest entry: Guido Merkins, Jack's alias at the motel. Those of you attempting to establish a pattern based on the previous Guy LaFleur and Von Hayes references, get cracking with this new data. • The end of "Chuck vs. the Cougars" made it clear that Sarah's real name is not Jenny Burton, which means Jack Burton isn't Jack Burton, and possibly not even Jack. Why's he still bothering to use that alias all these years later? He's using the alias because Big Trouble in Little China is one of the best movies ever! Loved it, the show is getting better each week. Sarah and Chuck are so completely together now... can't they get some physical rewards of that soon? And Gary Cole is beyond awesome. Bah, I was hoping to be the first to recpgnize the 'Big Trouble In Little China' reference. If only they had tried to sell the White Tiger to a Mr David Lo Pan, my life would have been complete. I'm pretty sure this is actually the second time there have been customers in O-squared (as I like to call it as of now). The first was in the intro of the place (in "Chuck vs. the First Date," I believe). As for the Burton thing, Chuck still believes Sarah's real name is "Jenny Burton," so it made sense (to me, at least) that she would introduce her dad to him with his Burton alias. the only thing I didn't like about this episode was how quickly Chuck went back to flirting with Sarah without us really see him apologize/explain what happened with Jill. I get that Sarah understood the situation, but it still seemed weird to have Chuck joke about cuddling on a fake double-date and suggest ramping up the PDA to make their covers more believable. I know we're supposed to gloss over stuff for the show, but it's hard to believe that Chuck and Sarah just pick up where they left off before Jill showed up. Alan, I realize that hockey doesn't exactly have the same presence of baseball or football right now, but c'mon, how can you feel comfortable calling a legend like Guy Lafleur "obscure?" In the spirit of Festivus, I confess myself disappointed. First line of Wikipedia's entry: "Guy Lafleur... is widely regarded as one of the most naturally gifted and popular players ever to play professional ice hockey." Reliability of Wikipedia notwithstanding, Guy deserves a little more love than what you're giving him. Maybe Chuck's dad engineered the Intersect? how can you feel comfortable calling a legend like Guy Lafleur "obscure?" I thought about that when I wrote it. I blame my Canadian-born father's disinterest in hockey, eh. Fine ep with the right balance of ridiculous/ludicrous. Was thrilled that Gary Cole's character wasn't the target. Awesome's "We've been waiting for you" line was great. Has their always been an Underpants Etc. next to the Buy More? I noticed it for the first time tonight. I think this was the first Underpants Etc. shot -- I noticed it too. Maybe LargeMart went bankupt. Bankupt...or bankrupt. One of the two. Probably the one that's actually a word. I noticed Underpants, Etc. too. And Chuck's velcro wallet. Classic. What was the song at the end. I didn't hold Shazam up to it. My bad. Boy, Chuck's bumbling/coolness ratio sure is spiking towards the cool spy end of the spectrum these days. I found his overly awkward nervous blundering a bit too forced last season. The show has to be careful though, or we will soon just not be surprised at either Chuck's smooth spy-pro turns, and Casey's actually-having-feelings moments. And is the good Captain's hint of loan sharkery a more towards him playing against type? Maybe the re-upholstery guys are really undercover NSA, using that excuse as a cover while they add even more gizmos to Chuck's Nerd-Herd car. Can anyone calculate the APR of Captain Awesome's loan? Because that scene was totally, well, awesome. The song at the end was "Furr" by Blitzen Trapper, from one of the most underrated albums of the year. http://www.youtube.com/watch?v=GzCi6qr5qKw I'm also a huge fan of "God & Suicide" from the album. Did anyone else notice the difference between Sarah as a, well, cute younger girl and her high school days? I guess everyone has their awkward years. As far as name dropping went tonight, Gary Cole registering into the hotel under the jaw-dropping pseduonym Guido Merkins (!) was a reference so obscure it blew my mind. Guido's was a former NFL backup quarterback for my beloved New Orleans Saints mostly. He had little to distinguish him except for that name...nice work Chuck writers. How soon until the latest ep of "Chuck" goes up on Hulu? My cable went out and I missed a chunk of the show tonight, bah. I quite enjoyed what I did see, though. And Gary Cole can do no wrong. I actually thought the blue-sy sound of the tail end score was reminiscent of Midnight Run, although given that Cole isn't in that movie, and I haven't seen (nor heard the music from) Midnight Caller, your guess is probably more on target. Did anyone else catch the "Dirty Rotten Scoundrels" reference, with Chuck receiving the message for Litchenstein? I thought that was familiar! I loved the DeLorean subplot and then the General Lee appearance at the end. Great stuff. They've kept Morgan immature but have eliminated the annoying part so successfully that I'm almost afraid to watch my Season 1 DVDs and be annoyed by him again. I am loving Chuck/Sarah right now. It was almost heartbreaking when Sarah's dad told her that she clearly loved Chuck. I think Chuck is further down the denial track whereas Sarah's feelings are only intensifying. Maybe we're just being shown more of that arc from her perspective, but I wonder where the arc is going. Of course, the real answer is "nowhere" since they can't actually get together for the sake of the premise. But since I'm optimistic about a Season 3 because of the quality of the show and the (slightly) improving ratings, I know *something* has to happen to "up the ante" for the next season. I almost envision a scenario where they sleep together at the end of the season and have to deal with the consequences (both work and emotional) next season. Okay, I've said to much. Lemon out. When Chuck first became Lichtenstein, I thought he was going for the exact posture and demeanor as Carl Reiner pretending to be a German financier in "Ocean's 11." Regarding the references to the various sports figures, we've had a reference to an obscure quarterback who played for the Eagles very briefly, and we've had a fairly obscure member of the Phillies, and a not very obscure member of the Habs (the exception that proves the rule).... all of whom played sometime during the 80's. My guess is that the next reference will be to a fairly obscure member of the 76'ers who also played during the 80's. If there's a pattern with the names, it might just simply be cool sounding sports names from the past that aren't household names. It follows Chuck Barris' use of Sonny Sixkiller as his alias as the original hapless CIA agent named Chuck (Confessions of a Dangerous Mind). I agree with Rachel there, that Yvonne should get some recognition for her consistent performances. No matter how important her character is to the episode's plots, she has been consistent in bringing her top notch performances and shines. my nitpick: DEMORGAN has eight letters. Regulation CA license plates only have room for 7.
overall a great episode, though. :) I, too, have much love for the velcro wallet. The velcro wallet was the highlight of the episode for me. But I will second (or third, or fourth, or fifth) Yvonne's continued greatness in the role. She hits every note just perfectly. It was just heartbreaking at the end when she said her dad wouldn't be back for a long while. An homage to the eight letters in OUTATIME. Did anyone else keep mis-hearing "cop-face" as "[slang for male-genitalia that might not be appropriate on a family blog]-face?" I assumed that when Jack gave Casey the cigar, he was stealing Casey's wallet or ID. I was a bit surprised to learn he was only stealing the cigar back. What was the point of that? The "plot hole" doesn't bother me so much most of the time, Alan. I find it's a good reminder that I'm not watching a James Bond or Jason Bourne story, and that the writers need to maintain the comic balance (and numerous pop culture references). If stories became too serious it would just lack some of the fun, don't you think? If stories became too serious it would just lack some of the fun, don't you think? It's not about being too serious, Michael. It's -- and I say this as someone who also doesn't really mind the plot holes -- that there needs to be a good deal of plot logic for the show to work, even within the mostly comic universe that it's created. Last year, when the show was still finding itself, the plot holes stood out a lot more. Because the show's been so consistently funny this season, they're not really a problem. But it's still amusing to me to bring them up at the same time I'm brushing them off as irrelevant, you know? In this particular case, I think the fact that this isn't a heist show by nature hamstrung it somewhat, in the same way that, say, "ER" often stumbled when its characters get involved in police stories. For "Chuck," this was a pretty good caper. By the standards of an actual caper show, it was thin. They didn't have to work very hard to get the sheikh to give up his account numbers, twice. Knowing that we've already hit the NHL, the MLB and the NFL, I'm guessing the next name is going to be from the NBA. To narrow it down some more, let's also assume that they had to have had their name known in the 1980's in some fashion, as that's always been Chuck's sweet spot. That suggests names like Kiki Vandeweghe, (NJ HS legend) Kelly Tripucka, Caldwell Jones, Jo Jo White, Artis Gilmore, Clark Kellogg, Fennis Dembo... just to name a few. I'd throw in names like Mookie Blaylock or Lloyd B. Free, but those would be toooooo distracting. Baseball player names have always ruled the roost, though, and in the 1980's there were plenty... Kent Tekulve, Sparky Lyle, Rollie Fingers, Goose Gossage, Danny Tartabull, Richie Zisk are just a few of my faves. It was interesting that "Jack Burton" showed up in the same episode as a DeLorean. Beta 3 Comics produces a comic book, Sniper and Rook, in which the title character -- named Jack Barton -- drives a DeLorean. Back in fine form this week after last week's mediocre outing. I was so happy to see the creative think on his feet Chuck return, with the whole Lichtenstein gag. Hilarious. Sure, the con was whisper thin, the Sheik was a dope, and yet, I had a smile on my face nearly the entire hour. Loved Gary Cole and thought Yvonne was outstanding. Cop Face and Schnook was funny. Thinkin' Casey enjoys playing with handcuffs a little too much. I recall the OO with a customer or two in the episode where Bryce returned and he and Sarah are talking about keeping it professional on the mission. But yeah, that whole set-up is kinda iffy. Much like the fact that nobody has ever addressed the death of Director Graham and Sarah now apparently reports to the NSA. Not to mention the fact that an agent as savvy as Sarah Walker thinks Chuck could really "walk away" after this intersect is gone from his brain. But it helps not to overthink a show as enjoyable as this. I thought Yello's "Oh Yeah" was used to overlay the parking attendant's taking off with Cameron's dad's Ferrari, not Ferris himself admiring it. No, they drive off to part of the "Star Wars" score. Just a terrific episode. I, too, want to salute YS's talents in the role of Sarah, and how successfully the show blends the serious with the silly and the action-packed. The scene with Sarah and Chuck in the hotel room, when he is making it clear to her that she shouldn't take her father's actions to heart, was just marvellous. For most of it, YS had nothing more to do than react, but she conveyed so much. Silverman was on Charlie Rose recently and the interview was simply sad. Sad because Charlie clearly still saw Silverman as the next big thing. Although NBC apparently still seems that way as well. Sad when Charlie mentioned that Silverman's mentor(name escapes me now, but former NBC programmer) had said that his greatest achievement was bringing quality shows back to television. Silverman stared at him like he had just been punched in the gut because he just spent the interview arguing that the future was all about branding. That it didn't matter what the product was as long as it was labeled "Today" or "Law and Order." And that the future of scripted television was complete product integration to the point that the original premise of the show is to simply sell a specific product. And Leno is a perfect move for those two beliefs. And Leno flows perfectly from those arguments. Nobody mentioned this yet: Anna is back! Finally! Where has she been? The unleash-the-Casey kind, not the real-life translating cell phone conversations kind. I had such a huge crush on Gary Cole in "Midnight Caller" in my early high school years. I agree that he's pretty perfect in just about anything. My favorite Casey moments of this ep were when he had a whole conversation grunting! Ah, silly Cop Face! And didn't Nicole Richie and her nerdy hubby stumble in to the yogurt place during "Chuck vs. the Cougars" ? I thought that was how they reconnected with Sarah before the reunion, and that mean girl Nicole made her wait on them. California does not necessarily have to issue two plates. They can chose to issue one. And if they do issue one, the plate goes on the rear of the vehicle. Thus, California may have issued only one plate to Morgan, so he could have had a custom job done for the front. Never mind that this show took place too quickly for Morgan to even get a state-issued plate (or two) in time. Also, the rear plate was never shown, so even if Morgan got two plates, he could have swapped his own for the front, anyway. Like he would bother following the letter of the law. I agree on the heist/scam bit seeming thin - seeing Chuck's take on the kind of Byzantine scams we've seen in Hustle or the Ocean's films would have been interesting, if perhaps a bit daunting to pull off in 40 minutes. Even though I've made my peace with the abyssal plot holes of this show, I still catch myself wishing the writers would put just a little more effort towards believability sometimes. Don't get me wrong, I think they're doing pretty much what they want to be doing, but I sometimes fantasise about the show Chuck would be if the spy elements were a little bit less Austin Powers, and a tiny bit more Queen & Country. I'm not campaigning for realism, mind, just a smidgen more plausibility and logic. I loved this episode! Gary Cole was great! Shnook and Copface made me laugh out loud. Oh did Chuck lend Morgan the 2500 from the 10M? So it wasn't in full amount when it was transfered to the CIA account? How did Alan not mention Big Trouble in Little China in his blog? Huge oversight! The first thing I thought of when Jack mentions "Nagamichi Towers" was Die Hard with Nakatomi Towers. I think that was what they were going for. -- As did Chuck's fake German accent to throw off the sheik and his own translator. -- Casey being offended by the "Cop Face" nickname. Guido Merkens (correct spelling) was the son of my Pastor in San Antonio. His dad was very proud of his football-playing son.